The anhinga is known by many bird names, some as strange and beautiful as the bird itself. It's been called snakebird, American darter, darter, water turkey, bec a lancette, water crow, grecian lady, and even incorrectly - cormorant. 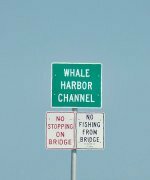 Other than it's strange names, it's also odd in the manner in which it catches fish. Their silent dive into the freshwater is done with barely a splash or a ripple. They then swim below the surface for 200 - 300 feet or more, in search of fish. When they surface, it's only for a few brief seconds to get enough air for the next dive. As they swim, their long necks snake back and forth, giving them one of their more peculiar names. They then return soundlessly to the depths of the water in search of more fish. This Florida bird is also typically seen in pairs during the breeding season, but in small to mid-sized groups the rest of the year. They also will fish in groups, chasing and herding fish beneath the surface of the water. One sunny afternoon while I was talking on the phone with a childhood friend, a snakebird dove into the water right in front of me. I asked her if she knew what a snake bird was and she did not. I proceeded to explain their unusual method of catching fish and her response was quite humorous. "Oh my! Can you imagine how awful that would be. Here you are, a nice little fish, swimming around minding your business, watching out for bad fish who may want to eat you. Now on top of all that stress, you've got to look over your little shoulders and worry about a bird swimming deep in the water after you. Now that's just not fair!" My friend isn't far off the mark, because whether or not fish do much thinking of any kind, this bird's method of hunting certainly adds to a fish's daily challenge of survival. 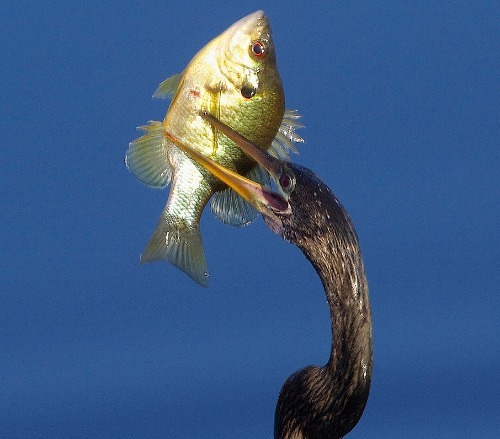 Well at least for fish that live in warmer climates since that's only where anhinga live. Due to the fact that they must warm up and dry off after swimming, they're unable to live where it's colder. This unusual bird looks much like a cormorant, with it's coloring, body form, and long "S" shaped neck. However, they're larger than a cormorant. They also have a long bill that measures about twice their head length, whereas the cormorant has a shorter curved beak. 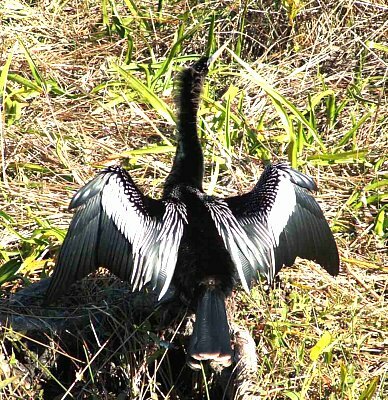 The anhinga also has an almost lacy pattern of silvery-white markings on their back that can be either spotted or striped. This attractive pattern dramatically stands out against the rich dark coloring of their backs. The males have a dark purplish coloring on the back of their heads, with their backs being a deep black-green set against the white markings. Their long tail feathers are a deep black-blue color. The females are lighter in color, with their throats and long necks being a yellowish-cream-gray and their backs more of a dark brownish black. The following posters, art and literature detail the fascinating beauty of these birds. Unusual in every sense, they are extremely striking, worth studying, and collecting information on. Notwithstanding their physical features, it's the way this bird is usually seen that makes it so identifiable. They're often spotted perched motionless at the end of tree branches, or on the edge of a bank. Their wings which span approximately 46 inches are fully outstretched as are their tail feathers. It's the spreading of their tail feathers that has earned them the nickname "water turkey". By spreading their feathers apart and opening their wings wide, they're able to completely dry off after being deep within the water. What's even more important is that this spreading of their wings and tail feathers exposes more flesh to the sun, effectively warming their chilled bodies. Unlike ducks and other water birds, this species is not "water proof". They don't manufacture the oil that protects feathers from becoming waterlogged. The only way they can rid themselves of this excess water and weight is to sit for long periods of time, facing into the sun to warm up, and wait for their feathers to dry. After they've spent time in the water fishing, their feathers are fully saturated, and they're carrying extra weight. When you watch one attempting to fly off after spending time in the water, the only way they can become airborne is by furiously flapping their wings and skimming the water with their webbed feet. Usually you'll spot a mating pair a few feet apart as they dry off in separate trees. After they've had time to completely warm up, they'll make a harsh, rather unpleasant croaking squawk and then fly off. Usually the male flies off first, then the female follows, and the female will occasionally utter a rattle type sound that sounds very much like a rattlesnake's tail. Of course this is not the reason they're referred to as snakebird, but it does add value to their name! 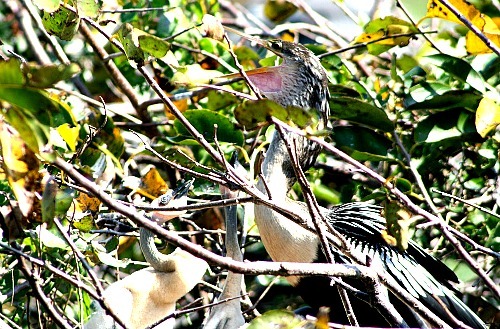 Anhinga are excellent fisherman, and with their long sharp beaks, they're adept at spearing their prey. Once the fish is "onboard", they swim to the surface, flip the fish off their bills into the air and then catch and swallow the fish. Since they attack the fish with such force, they can often be seen returning to shore with an impaled fish on their bill. To remove the fish, they then bang their beaks against rocks or other hard surfaces until it falls off. This pretty Florida bird begins to mate at about 2 - 3 years of age. During breeding season they develop a blue ring around their eyes. Once they've mated, the females will lay 3 - 5 eggs that are light blue in color. The nests are built higher up in trees and are composed of twigs and are lined with a soft bedding of leaves. About one month later, chicks hatch and they're bald at first. Within a few days they gain a tan down which changes to white. When they're about 3 weeks old they begin to develop their brown juvenile feathers and these are retained until their first breeding. 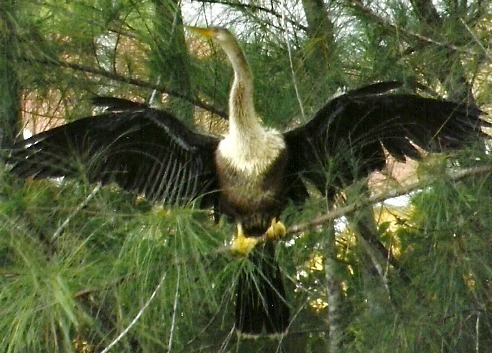 Anhinga are without a doubt one of the most interesting birds to watch. Certainly there are more majestic birds, more colorful birds, even odder looking birds in the Florida Keys and the Everglades National Park. However there's something special about watching a group of snake birds sitting motionless with their wings outstretched. Of course, witnessing their seamless entry into the water, followed by their miraculous appearance several hundred feet further down is always thrilling and surprising. Surprising and thrilling - if you're not a fish.